Pefkos is situated on the east coast of Rhodes not too far from the resort of Lindos and about 50 minutes from the airport. 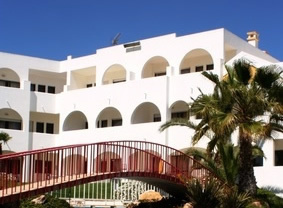 The resort is one of the most popular on the island with many clients returning year after year. Pefkos in Greek means 'pine tree' which gives you an idea of the local scenery and while it has grown from a sleepy little bay into a lively small resort with a long beach, crystal clear sea and with good water sports. The really relaxed nature of this place makes it popular with couples and families alike and it's a natural match for the freedom and flexibility of self-catering holidays. In Pefkos there is a good choice of accommodation that provides room only or self-catering facilities. If you enjoy shopping this chilled out resort can only provide a few souvenir shops and other necessities but nearby Lindos has a selection of shops and boutiques that are worth a visit for a wider selection. The beach here is not as crowded as they get in the neighbouring village of Lindos.The resort is generally quieter than its neighbour with less bars and discos but still a number of delightful tavernas, the pace is quieter, slower in tempo, and somehow a little more Greek. For a relaxing time, with a night or two in Lindos for serious fun, Pefkos offers the best of both worlds. Pefkos is a great place for a relaxing beach holiday but if you get the urge to explore, why not hire a car? To get a quote simply call one of our travel advisors on the number above.